Scent Twins and Evil Scent Twins used to be A Thing on the perfume forums. The idea was that your Scent Twin is a person whose taste in perfume is so similar to yours that you are virtually guaranteed to like any perfumes that he or she likes. Conversely, your Evil Scent Twin’s perfume preferences are the exact opposite of yours. ESTs can actually be terribly useful, because if your EST recommends a perfume, you know to stay the hell away from it. I consider my Scent Twins (Triplets?) to be Gaia of The Non-Blonde and Birgit of Olfactoria’s Travels. Time after time, those two ladies go for the exact same bold oriental scents that I do. Gaia even shares my love of Serge Lutens Louve, and nobody likes Louve. My Evil Scent Twin has to be Mals of The Muse in Wooden Shoes. She loathes my most cherished perfumes, and I’ll never understand what she sees in all those girly florals. She’s just lucky her writing is so damn compelling! It’s been way too long since I’ve heard anyone talking about Scent Twins and Evil Scent Twins, so let’s bring ’em on back! Who do you consider your Scent Twin or Evil Scent Twin? It can be a perfume blogger, a perfume blog commenter, or even a real-life fellow perfume lover. If you’re not sure who your ST/EST might be, then leave a comment telling us your perfume preferences and we’ll all try to figure out who to match you with! ‹ PreviousHoly Crap! I’m on Perfume Posse for a third time! Next ›No Post Today- Drew’s Graduating! What if you’re omniverous? Are you everybodies ST and EST? My closest person to a Scent Twin would be Robin of NST – she likes a lot of perfumes in the same “gentle to moderate” register as me. Evil Scent Twins? I am spoilt for choice, but Ines and Tarleisio would be high on the list (and wouldn’t mind my saying so, I hope!). Oh, you and Robin are twinsies for sure, V! I WISH I could find either type of twin; maybe someone here can help–I’m fairly certain I could save a pile of money if I could just follow someone on this path (or know to take a wholly separate path). My first love is L’Heure Bleue, and after that, I find myself turning to Guerlain’s Terracotta, Jil Sander #4, Coty’s L’Origin & L’Aimont, Cartier’s Baiser Vole, Mary Greenwell Plum, Banana Republic’s “W” and A. Goutal’s one that smells like pears (I can’t for the life of me remember its name right now), Lancome’s Climat, Magie, and Sikkim and Cuir de Lancome; Chanel 5 & 19, and Jolie Madame; and sometimes SJP’s Lovely, Chloe, and L’Air du Temps. Mind you, I have probably (literally) 100 bottles and vials on and in my dresser, but those are the consistent forerunners. You have much in commonn with Meg/Olenska I think! Hey, I love most of your list! But not all: I merely liked L’HB, Baiser Vole, Magie, L’Air du Temps, and don’t care for Lovely at all. Sikkim skeered me. But Plum, Jolie Madame, Cuir de lancome and No. 19 would make my favorites list as well, with No. 5, Climat, and those Cotys farther down. Is the Goutal with pear Petite Cherie? That’s another one I love for summer night comfort. Thank you, Mals–Yes, it is Petite Cherie. I couldn’t bring that name to mind for love nor money. I sometimes think that when my hormones left, they took my memory with them. (Note to hormones: Just name your price. I’ll pay up.) Mals, I have thought you and I were close in our likes, but then I bought that PdN of which you often speak so fondly, Le Temps d’Une Fête, and it completely missed the mark for me. It was a vial, however, and I do find spraying makes a big difference for me, anyway, in deciding if I like a scent. ooh I love me my Petite Cherie! And I’m with you, I just don’t LtduF – at all! Ooh, I love lots of those, Joanne! I have to agree with everyone who said Mals or Olenska were natural matches. But you have such wonderfully eclectic tastes that you really might need lots of scent twins! What a coincidence, Mals is my EST too! I don’t go for the girly florals either, and she loathes the heavy spices, leathers and orientals that I love (she HATES Youth Dew, one of my all-time favorites). Count me in as another Louve-lover! That is, I loved it at first sniff, but it fell apart and disappeared after 15 minutes, like all Lutens fragrances do on my skin. Guess I just have that type of skin, maybe that’s why I need the heavy-hitters. So that makes you and Gaia my STs as well. Please don’t take it personally! An Evil Scent Twin is a very useful person to have, i.e. I have received from you two frags that you didn’t care for but that I love: Aimez-Moi and Mitsouko. Oh, not taken personally! We can’t all like the same things, that’s boooooorinnnnng. and it would be nice if I could spell Katie’s last name properly – sheesh!! Puckrik! There’s nothing wrong with being an EST!!! It means your tastes are different, not wrong! Olenska is my EST only in that she somehow always finds amazing vintage perfumes and I do not!! Ms. Puckrik is a worthy ST indeed/ homegirl looooves her incense scents! I think that I might have underestimated the Louve love due to all its bad reviews on MakeupAlley! It’s so nice to see everyone on here taking up for it! I haven’t yet found an actual ST, but Musette at the Posse comes pretty close. So does Donna/Flora at PST. I have a lot of common ground with Patty, from her list of faves up there, and with Angela at NST as well as Olenska. But I had to SQUEEEEEEE over that pic, Ari! I lurve me some vintagey Kirk (biceps!!). 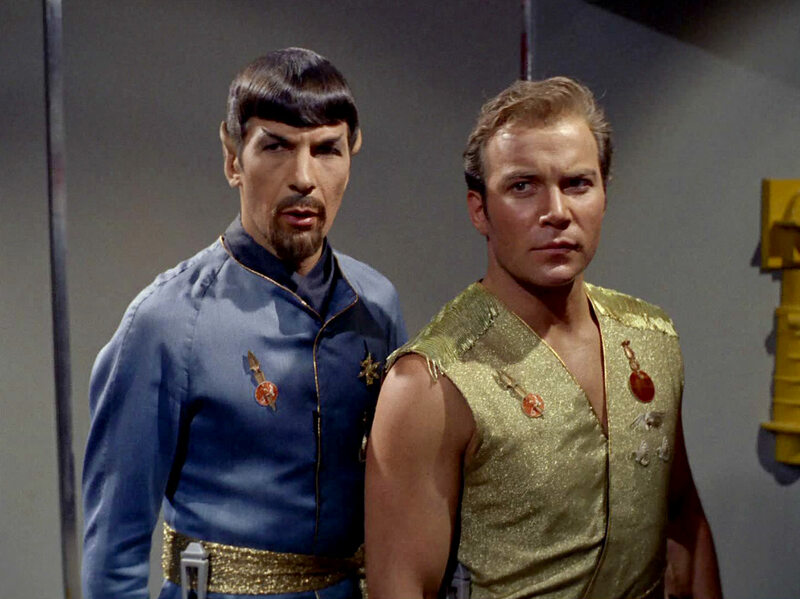 And bearded Spock, woo-hoo! I mean “common ground with JOANNE.” Sorry. Brain fart. AND WE LOVE YOU! Especially because you recognize eeeevil Spock! Weirdly, Tom is one of my ESTs too! He recently called Bijou Romantique “something I wouldn’t wear in a million years” in a Perfume Posse post. Meanwhile, I can’t STOP wearing it! My immediate ST sorority = BloodyFrida, JoanElaine, Suzanne, and my pal JC. Carol of WAFT also infallibly guides me towards the richness of scent I crave. I don’t know if I have an EST, other than the nameless stockists at Sephora, Macys & Target who flood the shelves with the sort of pre-adolescent fruity-candy bling-bling that shatters my soul… and possibly this one (very nice) elderly coworker who thinks Tova Borgnine Signature is the gold standard against which all other perfumes must be compared. The handshake takes twenty minutes alone, and there is a segment of the pledging process where you have to do a Little Edie Bouvier impersonation in the inappropriate setting of your choice. But then you’re IN. I’ve thought about my scent twins a lot. When I first added her to my blog-reader, I thought Mals might be my scent twin, but I’ve come to the conclusion that while I share a lot of tastes with Mals, but I wouldn’t say we’re total scent twins – she loves some cold-hearted green fragrances that I haven’t learned to love yet (eg No.19), and I adore citrus as a category, and she doesn’t. I also share a lot of tastes with Angela on NST, Kathleen of No Disassemble Charlie, and Undina, but neither are perfect fits. I’ve also suspected I share some taste with Brian Pera. However, I think the closest “fit” with my taste that I’ve seen out there so far is AnneMarieC from BOTOblog… I don’t know if I’ve ever told her this, though! That’s the mark of a truly great perfume blogger, I think- they make you perfectly willing to read about perfumes that you’d never in your life wear!! Hmm, not exactly sure who my ST and ESTs are. There are perfume areas that overlap and others that don’t with almost every blogger I read. I strongly dislike, hate even, fruity scents, big white florals (although I do love Dior Pure Poison, go figure), anything really sweat and sugary and especially aldehydes. I love spice, wood, leather, chypres and a bit (although not too much) of animal. Loves are vintage Diorella, No.19. Bois des Iles, Cuir de Russie, Rue Cambon, Odalisque, Temps d’Une Fete, vintage Mitsouko, Opium and Youth Dew. Looks like I’m all over the place. Funny, those BWFs are the only thing I seem to have in common with CPB. Then you must be my EST :-). But I think you like Miriam? Which I adore! Oh, but Mitsouko HATES MY GUTS. For a while I hoped to find my ST or EST but everybody who I know/read love some perfumes I cannot stand and don’t find some of my loves to be anything special. I LOVE Climat, No 19, Ubar, Petite Cherie, Ta’if (and more) whereas No 5, Shalimar, L’Heure Bleue, Mitsouko and Fracas do not work for me at all, no matter how hard I tried. Somebody needs to WRITE that story. I seem to be close to Mals in some ways, Temps d’un Fete, and Vanille Tonka, love florals like Frangipani and Tiare by OJ, , Love love love SSS Velvet Rose, love Jour ensoleille, love me some Fracas, still have a bit of trouble with Carnal Flower and Mona di Orio’s Tubereuse however. Not for me Amouage Honour Woman, but LOVE Epic Woman, although her sister Lyric Woman, smells very awful on me. Lyric man is nice but I don’t crave it like I do Epic. I think I have a bit in common with Suzanne, love Coromandel and Un Lys, Amber Fetiche, but I love Encens Flamoyant, Filles en Aguilles, and SSS Incense Pure too. Love Chanel Beige and Gardenia, and swoon for Chergui. I’m with Ari on her latest Hermes, must have Amber Narguille but I also love love Jo Malone Dark Amber Ginger Lily. I like Diorissimo, love Tolu but Orris Noir no no no. So, Looking at that it looks like, florals but not all, ambers, and some incense/woods. ST or EST.. I don’t know. I consider you a pretty good guage for things I will like (see: Coromendel, Prada, most gourmands), so by extension Gaia is a safe bet as well. 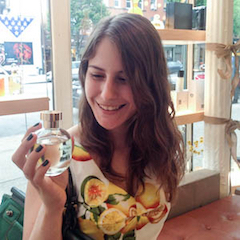 I consider Robin to be an EST, which is funny because she is one of the perfume bloggers I enjoy the most. When she respects a perfume but delicately suggests it isn’t her thing I know to seek it out. I really want to find my ST and EST, but no such luck. I love leather and soft florals, green things, powder and orientals. Tuberose is my nemesis as are heavy indolics. Agent provocetuer was a scrubber and a tiny Rubj sample vial was triple bagged and boxed in an unused closet until I’m brave enough to try again. I about died sniffing Carnal Flower in Barneys. Yet I love poir le soir and many clean musks. Angela from NST might be a candidate since I often like her choices. Such a fun post. I’d love to be someone’s EST! Bwaa haa haa. I will douse you in Mimosaique and Chanel #5 and spray you with Dia and #19 and roll you in laudanum. There will be much rejoicing while you squirm. Note that I am too quick to get caught in your attempt to Fracas me. Bwaa haaa haaa. I would now like a superhero fight with fragrances, please. Oh, I want to find a ST sorority! I have a penpal from MUA who has VERY similar tastes to me. Let’s all make lists! * Cumin and sweat notes. I like leather but not animal. You might be pretty close to an EST for me, with your Bois Farine and Bijou Romantique – neither of which I would ever, ever wear. It’s not that they repulse me, they just – Do Not Want. mals is pretty close to my ST; I can’t think of anything she’s ever loved that I didn’t love too, and I bought a bottle of Plum unsniffed entirely because of her love for it – I knew I would love it too. Gaia is probably an EST for me past a certain point – I love her taste, but at the far edges (DIORESSENCE????) I simply cannot go there with her. If Robin on NST likes it I will too. STs are good pals to have. My EST and I trade samples with each other. She’s a good pal to have, too.